The information presented on this page was originally released on December 15, 2011. It may not be outdated, but please search our site for more current information. If you plan to quote or reference this information in a publication, please check with the Extension specialist or author before proceeding. MISSISSIPPI STATE – Mississippi’s agricultural commodities are predicted to reach a record-high value of more than $6.7 billion for 2011. 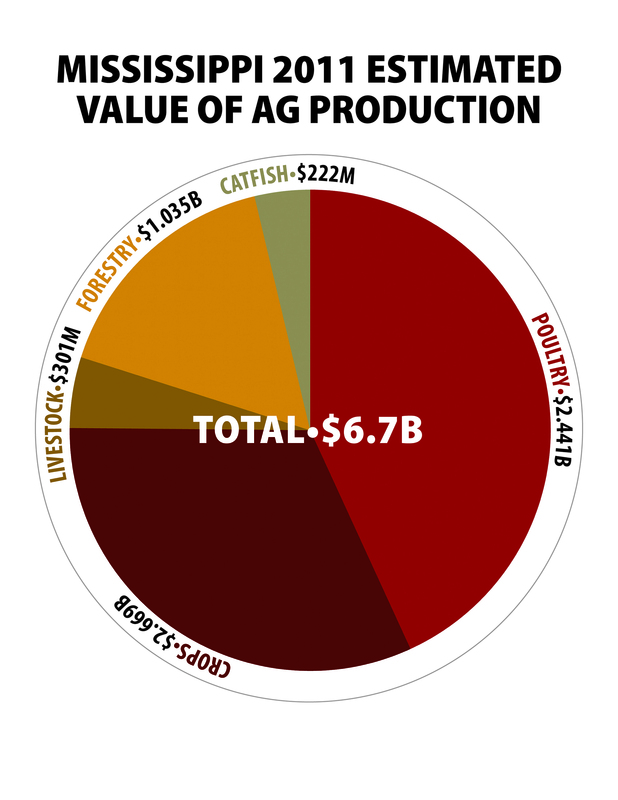 Mississippi State University Extension Service economists compiled the numbers from poultry, forestry, agronomic crops, catfish and livestock for the annual value estimate. If government payments are factored in, the state’s value of production reaches $7 billion for the first time in history. Extension agricultural economist John Michael Riley said the record is a result of high yields and strong market prices for most commodities in 2011. The state’s top three commodities remain poultry and eggs ($2.44 billion), forestry ($1.04 billion) and soybeans ($860 million). Their values changed little from 2010. The biggest changes occurred in some of the smaller crops. Compared to 2010, the No. 15 crop -- grain sorghum -- is predicted to increase 653 percent in value. The No. 10 crop -- wheat -- will increase 492 percent in value. Cotton will increase 63 percent, and corn will increase 42 percent. Larson said drought conditions in 2010 prompted growers to increase their acreage of grain sorghum because it is more drought-tolerant than corn. Corn acres also increased from 750,000 to 820,000 in 2011, but yields declined from an average of 136 bushels per acre in 2010 to 118 bushels per acre in 2011. Corn ranked fifth among the state’s agricultural commodities with an estimated value of $595 million. Wheat’s 2011 estimated value is $127 million. Larson predicts wheat acreage to exceed 400,000 for the coming season. Cotton lint is posting a 60 percent increase, and cotton seed is posting an 88 percent increase in value. The combined cotton value is $599 million, placing it in the No. 4 spot. Mississippi growers planted 630,000 acres and averaged 952 pounds per acre. In 2010, they planted 420,000 acres and averaged 993 pounds per acre, which was the second highest yield on record. At No. 6, catfish is expected to post a 2 percent increase to $222 million. Stockers declined 31 percent, but catfish, fingerlings and fry increased between 3 and 5 percent. 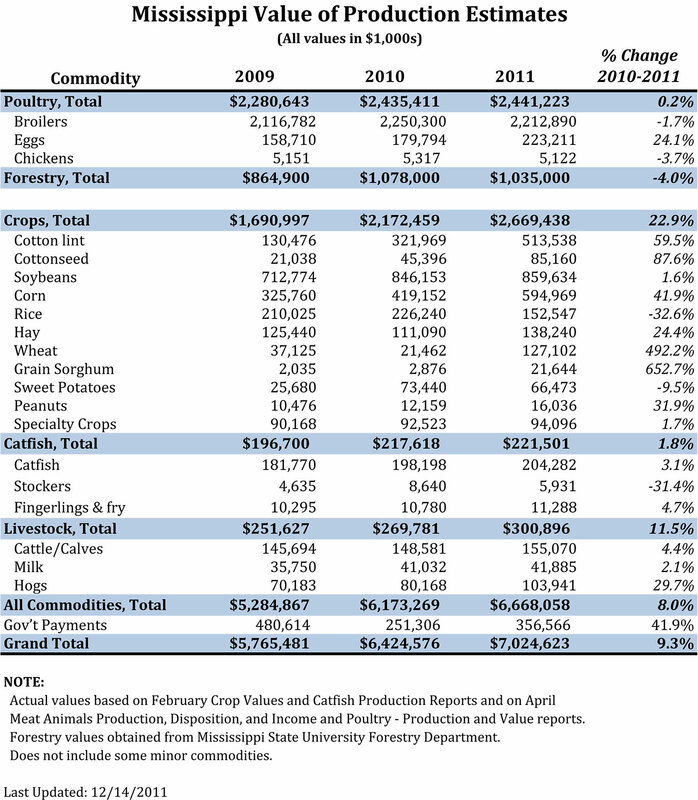 All of the state’s 2011 livestock categories are predicted to increase in value. At No. 7, cattle/calves are forecast at $155 million, up 4 percent. Hay production, the No. 9 commodity, is valued at $138 million, up 24 percent. At No. 11, hog values are estimated at $104 million, up 30 percent. Milk is the No. 14 commodity with a value of $42 million, up 2 percent. The No. 8 commodity, rice, had one of the more significant declines of the year. The 2011 value estimate is $153 million, down 33 percent from $226 million the previous year. Extension rice specialist Nathan Buehring said most of the decline in value can be explained by reduced acreage. The No. 12 commodity is horticultural and specialty crops, valued at $94 million, up 2 percent. A record 22,000 acres of sweet potatoes, the state’s No. 13 crop, were planted in Mississippi in 2011. According to the Mississippi Sweet Potato Council, growers averaged 275 field packs (50 pounds each) per acre. In 2010, they planted 21,000 acres and averaged 285 field packs per acre. Peanuts rounded out the state’s agricultural commodities in the No. 16 spot, with an estimated value of $16 million. Growers planted 16,000 acres in 2011, continuing a decline since the peak of 22,000 acres in 2008. Yields tied the 2008 record of 3,900 pounds per acre, a 400-pound increase from the previous year.